JFK was perhaps America’s most charismatic President. He entered the highest office of the land at the dawn of a new decade in a time of great hope, promise, and prosperity. He was an advocate of many forward-reaching causes, ranging from Civil Rights to Nuclear Non-Proliferation. During some of the greatest Crises of the Cold War, President Kennedy relied on his intellect rather than brute strength to broker for peace. In his short tenure as commander-in-chief, President Kennedy avoided war with Cuba, Vietnam, and the Soviet Union. His cool and compassionate intellect had the great power of putting out the flames of many hotter heads. Kennedy was also a pioneer in a golden age of television, using his good looks and sharp wit to win voters through the airwaves. The importance that television plays in electoral politics to this day is a direct legacy of President Kennedy’s panache. 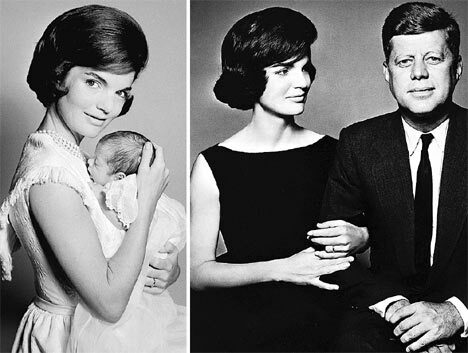 A beautiful and urbane first lady on his arm, and two charming children at his feet, President Kennedy’s First Family came to represent all that Americans could accomplish in the newer and freer 1960s. Of course, not everyone appreciated President Kennedy or his policies. Kennedy had enemies on all sides and of all sizes, foreign, domestic, federal, state, and private. There was the usual crowd of wealthy right-wing industrialists who use their money and influence to hinder the more progressive Presidents and the typical militant segregationists filled with bile and hatred, but there were also Pro-Castro Cubans, Anti-Castro Cubans, Mobsters, and KGB operatives who were all dying for a shot at Kennedy. Within the United States itself, is said to have Kennedy had made enemies with the FBI, CIA, Federal Reserve, and some say even the Armed Forces of which he was the Commander-in-Chief. On the afternoon of November 22nd 1963, President Kennedy cruised Dallas, Texas in an open top limousine as part of a whirlwind goodwill publicity tour which took the President through the major cities in the state. The rationale behind the risky trip was highly political. Electoral support in Texas had been crucial to his narrow victory against Richard Nixon in the Presidential election of 1960. JFK was pulling out all the stops to keep Texas in his column in 1964. He wanted to be seen out in the open, among the people, using his tremendous charisma to win voters over one crowd at a time. He even convinced his charming wife, the elegant but inauspicious First Lady Jacqueline “Jackie” Kennedy to join him on the trip. She had not campaigned with her husband since the loss of their infant son Patrick earlier that year, and when she did appear to the public it was generally in dark glasses. Knowing that Jackie might be Jack’s best chance to hanging onto the Presidency next November, he finally convinced her to take off her glasses and return to the people. Kennedy’s motorcade was the perfect opportunity to do just what the President mentioned. The visit had been publicly planned for five months, the route of the President’s motorcade was published in the newspapers, the bubble top was removed from the presidential limosine, the Secret Service had no military or police support in the streets, and the windows to countless potential sniper nests were left open. The final turn of the motorcade forced the President’s car to slow to 11 miles an hour. Although Secret Service protocol required Agents to cover the vehicle in circumstances such as these, and indeed they had done so earlier in the motorcade, no agents hopped on the President’s car or even bothered to run beside it during this highly venerable and ultimately fatal turn. Many allege this was because agents were allegedly ordered off the back of the limo in order to make the President seem more accessible to the people. Just where exactly this order came from has been debated for decades, but whoever gave it made a fatal error. If there was a perfect time and place to do the President, it was that lazy Friday in Dallas. Jackie gives the camera a haunting glance moments before the fatal shots rang out. As the motorcade rounded the corner of Houston and Elm in Dealey Plaza at 12:30, a shot rings out. Most of the witnesses thought this first sound was from fireworks or motorcycle backfire, but Texas Governor John Connally, seated in front of Kennedy, heard what he immediately knew was a high-powered rifle. Another shot rings out, hitting the president directing in the head and sending a portion of the President’s skull and a large amount of his brain matter into the air. President Kennedy’s head explodes from the fatal headshot. From the front or back? In between the second and third shots, Secret Service Agent Clint Hill, the man in charge of protecting the First Lady, leaps into action. He hops off the follow car and rushes to the back of the President’s limousine. Just as Hill grabs ahold of the car, the third shot rings out and the President’s massively traumatized head falls into the lap of the First Lady, bloodying her dress and the limo. Jackie pulls herself out of the car and climbs onto the trunk, reportedly to retrieve part of the President’s head. Hill pushes Mrs. Kennedy back into the car, and spreads himself across the back of the vehicle as driver William Greer speeds off to Parkland Hospital. As the motorcade barreled across the freeway at breakneck speeds, Jackie desperately tries to hold together her husband’s exploded head as she calls out her love for him and asks if he can hear her as Agent Hill pounds his fist on the trunk in sorrow. The limo arrived to the hospital within minutes, but despite the valiant efforts of the trauma doctors and staff, Kennedy is declared dead. A stunned nation is shocked and scarred for generations. What exactly happened in Dealey plaza at 12:30 that day has been the subject of the most heated debate in American history. Scientists, lawmen, lawyers, historians, and experts in every field of thought and reason have endeavored to solve the mystery. Rumor has that Cuban exiles, mob hitmen, Corsican assassins, French gunmen, CIA spies, and militant right wingers were all gunning for Kennedy’s motorcade that afternoon. There had been rumors of other assassination plots against Kennedy in Chicago and Miami, one run by angry gangsters, the other filled with enraged Cuban Exiles. But whatever dark plans may have been put into motion that day by sinister forces, history alleges that one man just happened to be in the right place and the right state of mind to fire the fatal shots on November 22nd. Lee was a 24-year-old former marine who had once defected to the Soviet Union only to return with a Russian bride named Marina. The morning of the assassination he left his wedding ring in a cup, put a strange package under his arm, and carpooled to his job at the Texas School Book Depository, a 7 story building situated on the last turn of the President’s motorcade through downtown Dallas, which had a clear view of Dealey plaza as the limousine slowed to 11 mph on Elm Street. A few minutes after the assassination, Lee left the depository without his package and worked his way home. 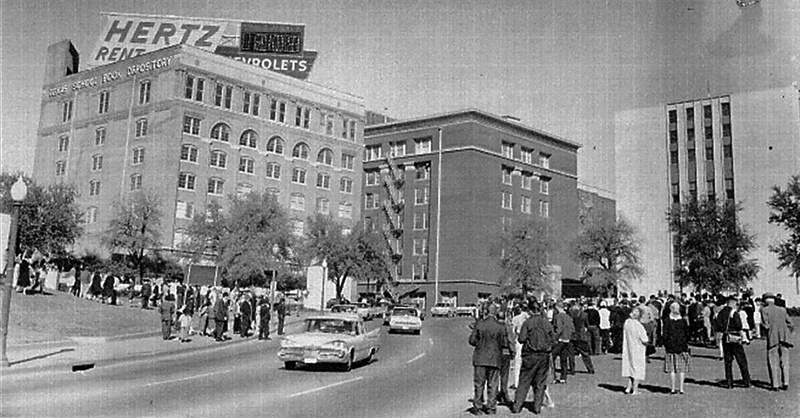 Minutes after the assassination, eyewitness Howard Brennan—who was standing across the street from the depository at the time of the shooting—tells authorities he saw a gunman who matched Oswald’s description. The hunt was on for a subject matching Brennan’s description, and within minutes of the shooting, the entire Dallas area was brimming with police officers, detectives and federal authorities looking everywhere and talking to everyone. Meanwhile, Lee Oswald returns to his boarding house in the Dallas suburb of Oak Cliff, puts on a coat, grabs his revolver and hits the streets. A few minutes later, Oak Cliff Policeman J.D. Tippit is brutally murdered by a pedestrian with a pistol. The assailant mutters something about a “poor dumb cop” or “poor damned cop” before dashing off on foot. At about the same time, Dallas Police find a rifle on the Sixth floor of the Book Depository, which is eventually traced to Oswald’s alias A.J. Hiddell. Oswald is next seen lurking in an Oak Cliff shoe store. He leaves quickly, but the manager of the store senses that Oswald is acting suspiciously and goes to get help. Oswald slips into the nearby Texas theater without buying ticket, and sits down as the film War is Hell flickers in the darkness. Police officers rush into the theater, and Oswald is pointed out as the suspect. Oswald strikes one of the officers, allegedly pulls out his revolver. Oswald is struck and subdued by the officers, and then calls out that “I am not resisting arrest!” The suspect is then carted out of the theater exclaiming “Police Brutality!” By then a mob had already formed in front of the theater. 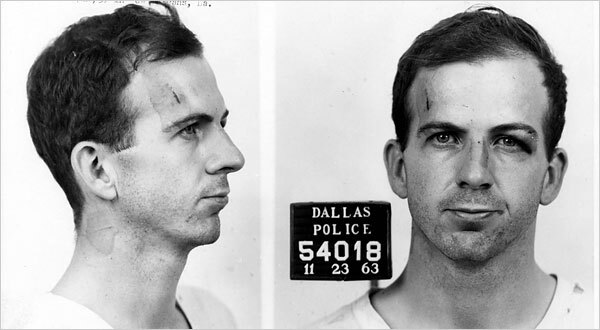 Nonetheless, Oswald is charged with the murder of President John Fitzgerald Kennedy and Officer Jefferson Davis Tippet. Whether he was guilty of these crimes or not, Oswald never did get to tell his side of the story. 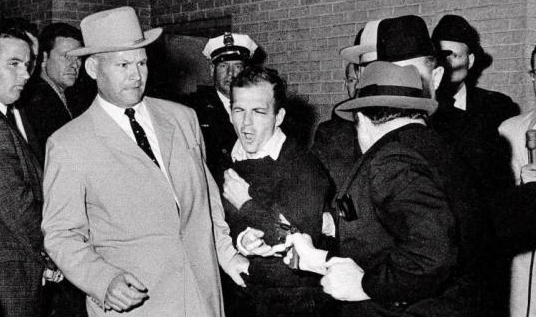 As Oswald was being transfered from the Dallas Police Station to the County jail, Dallas nightclub owner Jack Ruby thrust himself out of the crowd of reporters and shot the alleged assassin in the gut. A doctor attending Oswald’s wounds tried to wrench a confession out of the dying prisoner. Oswald shook his head “no” and expired, his story silenced forever. Speculation ran wild. Lee Oswald was reported cavorting with pro-communists and anti-communists the summer before the assassination in New Orleans. Jack Ruby, who had been drifting around the Station all weekend masquerading as a reporter, had pals both in the Mob and the Dallas Police Force. Were any of these organizations involved in the assassination of JFK or the subsequent murder of his alleged assassin, or ? In a poll taken after the assassination, a resounding majority of Americans believed some one else was involved in the crime. In order to clear up the apparent confusion, the newly sworn in President Lyndon Johnson formed The President’s Commission on the Assassination of President Kennedy. to present a report on the circumstances of the assassination. The Commission was initially vaunted as an auguste jury of statesman, but some the members most influential to the proceedings were of questionable moral caliber. Prominent commission member John McCloy has become infamous for various questionable acts over the years. He was instrumental in implementing the shameful internment of Japanese-American citizens during the Second World War, and helped convinced President Franklin Roosevelt not to bomb the Auschwitz supply lines which brought Jews to their death during the Holocaust. After the war, McCloy helped Nazi officer Klaus Barbie, the despicable “Butcher of Lyon,” escape to South America. Barbie was eventually convicted of war crimes. Commissioner Allen Dulles, who dominated the proceedings, participated in numerous illegal foreign Coup d’Etats as Director of the Central Intelligence Agency. He is responsible for turning America’s intelligence apparatus into a international assassination ring, a legacy that the CIA lives with to this day. The report concluded that three shots were fired. The first shot missed the limousine entirely. The second shot hit the president in the back, exited his throat, hit Connally in the back, exited his body, hit his wrist and eventually his thigh. A bullet found on a stretcher at Parkland Hospital, known as Commission Exhibit 399. The third and fatal shot hit Kennedy in the back of the head. Finally, Commission members firmly stated that Oswald had acted alone in the shooting and there was no evidence of a conspiracy. Some found the theory that the second shot caused so many injuries highly suspect, and began to regard it as the a “magic” bullet. They also claimed that the bullet was too “pristine” to have caused as much damage as it was purported to, although the bullet is clearly warped from certain angles. Commission member Hale Boggs wasn’t satisfied with the theory, and was in support of the Commission releasing a dissenting opinion. Despite these concerns, the Commission released their findings as conclusive. President Johnson publicly accepted the Commission’s findings, and lauded their efforts as comprehensive. After leaving office, Johnson admitted that he still had doubts about the conclusions of the commission he had formed, and admitted he was still concerned about the possibility that some sort of international conspiracy was involved in the murder of President Kennedy. Lane captured the public imagination with his controversial book and accompanying film Rush to Judgement. Edward Epstein analyzed the flaws in the Warren Commission investigation with his 1966 book Inquest. Josiah Thompson tried to blow a whole through the government’s official version of the assassination 6 Seconds in Dallas. The greatest debate in American history had begun, with many parties pointing their fingers at numerous suspects other than Oswald. Meanwhile, a secret investigation into the Kennedy murder was underway in New Orleans. The results of this investigation would not only polarize Warren Commission supporters from critics, but also cause a crucial schism in the critical community itself that remains to this very day. The summer before the assassination, Lee Harvey Oswald had been rebel-rousing in his home town of New Orleans, the notoriously outrageous Delta port of call. New Orleans had inherited a healthy population of displaced anti-Castro Cubans after the communists took Havana, and Oswald immediately became fascinated with all the communist intrigue they brought with them. When Oswald arrived in town in the summer of 1963, he at first played friendly with a group of Anti-Castro Cubans, then got in a fight with them for distributing Pro-Castro fliers in the street. The fliers, which read “Hands off Cuba” incensed the publicity head of the group, Carlos Bringuier and they decided to go rustle Oswald up. A brief altercation ensued. Oswald was arrested and fined $10 for the strange “Hands off Cuba” incident. Afterward, Oswald debated the Bringuier on a local radio broadcast. Most interestingly, some of the fliers had been stamped with the New Orleans address 544 Camp Street, a unit in the same building as the office of Guy Bannister, former head of the Chicago FBI, and perhaps the most virulent anti-communist in the Delta. Why was New Orleans most notorious communist sharing walls with it’s biggest anti-communist? Some say Oswald, who generally stamped his home address on the fliers, decided to print the Camp Street address to embarrass Bannister. Others claim that Oswald and Bannister were not only neighbors, but that Oswald was really working for Bannister and the “Hands off Cuba” affair was really a smokescreen to set up Oswald. Another New Orleans anti-communist who was a known associate of Lee Oswald was a mysterious figure named David W. Ferrie. Ferrie had tried to be a pilot and priest, but always sabotaged his own career with sexual scandals involving young men. As a teenager, Oswald had been under Ferrie’s command in the Civil Air Patrol. Some say that Oswald was cavorting with Ferrie in New Orleans during the summer of 1963, but no photographs or documents have surfaced to confirm these allegations. The day of the assassination, Ferrie took an unplanned trip to Texas, where he apparently spent most of the day in an ice rink phone booth. After Oswald was announced as the assassin, New Orleans District Attorney Jim Garrison decided to bring in David Ferrie for questioning. Whether Ferrie was involved in a conspiracy or not, he certainly understood that being a pilot who was a known associate of Lee Oswald and took a trip to Texas the day he murdered the President didn’t look good. Garrison was suspicious and decided to hold Ferrie for further questioning. Higher authorities released Ferrie and chastised Garrison for holding him as a suspect. In 1964, The Warren Commission staff interviewed an eccentric New Orleans attorney named Dean Andrews, a law school pal of Jim Garrison. Andrews claims to have done some legal work for Lee Oswald in the summer of 1963, charging him 15 or 25 dollars to change Marine discharge to “honorable.” Andrews says that this little bit of work came to him through a man named Clay Bertrand, who he claims regularly sent him swarthy “swishers” who were in legal trouble for cross-dressing and other petty offenses related to the the New Orleans homosexual underworld. According to Andrews, Bertrand called him the day of the assassination and asked him to be Oswald’s lawyer. Andrews was sedated in a hospital at the time and allegedly told Bertrand that if he couldn’t represent Oswald himself, he could find someone else to do it. Oswald meanwhile, was trying to get representation from a famous civil rights attorney in New York, turning down his brother Robert Oswald’s offer to get Lee a lawyer himself. Andrews’ description of Clay Bertrand varied in the accounts he gave to the FBI and the Warren Commission. To the Feds, Andrews said Bertrand was over 6 feet. To the Commission staff, he says Bertrand was under 6 feet, but that he couldn’t really tell because Bertrand was sitting down. His description of Bertrand’s hair and complexion varied wildly in his accounts the FBI and the Warren staff as well. The Commission staff member who questioned Dean Andrews seems incredulous of Andrews’ story, pointing out the discrepancies in his description of the Bertrand character. Andrews said he didn’t think Oswald could have done the shooting, and that he was determined to find Bertrand and the real shooter. Andrews claimed that the last time he saw Clay Bertrand, Bertrand had gotten up and ran away. The FBI, who initially questioned Andrews on the matter, was unable to locate anyone by the name of Clay Bertrand. Although the mainstream press and the majority of government officials publicly supported the conclusions of the Warren Commission, the American people couldn’t quell their suspicions that other groups or individuals must have been involved in the Kennedy assassination. Even several key public figures who officially sided with the governments version of the case are reported to have privately expressed their doubts. JFK’s brother, Attorney General Robert Kennedy believed that the assassination was a retaliation from one of the Kennedy family’s many enemies according to his aide Edwin Guthman. Richard Nixon’s reference to the Bay of Pigs in the infamous Watergate tapes is also actually a veiled reference to his belief that there was a Cuban connection to the assassination according to Nixon Chief of Staff H.R. Haldeman. Even President Lyndon Johnson, the man who commissioned the Warren Report told Walter Cronkite that he believed there may have been international connections to the President’s murder (Footage of this shocking admission is readily available on the internet). In 1966, civil rights attorney Mark Lane published the book Rush to Judgement, the first mainstream publication to challenge the conclusions of the Warren Report. The book, which was also adapted into a documentary film, is essentially an attorney’s brief offering a legal defense of Oswald, pointing out holes in the Warren Report. Lane’s book was a bestseller and established a cottage industry of books challenging the government’s version of the assassination which continues to be a lucrative business to this day. The same year that Rush to Judgement was published, the District Attorney of New Orleans Jim Garrison began investigating Oswald’s New Orleans connections. Eventually, Garrison became convinced that the assassination was part of a broad-ranging conspiracy and in 1969 tried the only case in the Kennedy Assassination. The accused was New Orleans-based businessman Clay Shaw, whom Garrison alleged was a government agent who planned a conspiracy with Dave Ferrie to assassinate the President. Garrison’s case was plagued by public controversy due to his inconsistent statements and allegations of unethical methods of interrogation. In the end, Garrison was unable to get credible witnesses on the record and failed to offer any concrete evidence linking Shaw to the crime. Shaw was acquitted of the crime but never managed to recover fully from the ordeal of the trial and died shortly thereafter.The major achievement of his investigation was subpoenaing the Zapruder film of the assassination from Time/Life which would eventually figure prominently in many subsequent conspiracy theories. Garrison and his investigation remain controversial to this day, even among conspiracy theorists. Was Garrison a crackpot who staged an arbitrary vendetta against an innocent man or was his investigation sabotaged by the media and the intelligence community? Garrison himself has become a symbol of those who challenge the Warren Report’s conclusion, serving as the inspiration for Oliver Stone’s 1991 film JFK. In the late sixties, a young photographic technician Robert Groden who had turned 18-years-old on the day of the assassination was working on a contract with Time/Life and managed to make a copy of the Zapruder film. Groden became convinced that the back and to the left motion of the President’s head after the kill shot proved that the gunshot came from the front and could not have been fired by Oswald. Groden screened the film on Geraldo Riveria’s late-night talk show in 1975 and convinced many viewers of his theories. Groden remains a key figure in the conspiracy theory movement, especially the photographic record of the event, authoring several books on the subject. In 1975, a Senate Select Committee led by Senator Frank Church shocked the nation when it exposed the United States Intelligence Committee was involved in the assassination of several world leaders including Patrice Lumumba of the Congo and the Diem brothers in Vietnam. These incendiary discoveries reawakened the nation’s suspicions that there was more to the assassinations of JFK, RFK and MLK than the government’s official story that each of these key leaders in the 1960s had been murdered by lone nuts. If the government was involved in other assassinations of world leaders, could the attacks against our own public figures be a retaliation against these abuses of power? Even worse, was the government itself involved in the assassination of its own leaders? Growing public unrest regarding these concerns led to the formation of the House Select Committee on Assassinations (HSCA), which was charged with investigating possible conspiracies regarding the JFK, RFK and MLK assassinations. The committee re-evaluated the evidence from the case and explored several of the loose ends left open by the Warren Report. Up until the end of the investigation, the HSCA generally agreed with the conclusions of the initial investigation. Just before their conclusions were to be announced, newly discovered “audio evidence” led them to believe that there had been additional shots from the grassy knoll and there was a probably a conspiracy. However, the validity of this evidence has been challenged by several credible sources. The Committee requested that additional resources be allocated to the investigation of the assassination but that request was never fulfilled. Public opinion Kennedy was killed by a conspiracy had been steadily climbing since the late sixties and reached a fever pitch by the end of the investigation. According to a Gallup poll, at the time of the assassination 52% of Americans believed that JFK was killed by a conspiracy. This number dipped slightly by the time the Warren Report was released but by the end of the HSCA investigation, a staggering 81% of Americans believed that a conspiracy was involved in the assassination. Throughout the 1980s a steady stream of conspiracy-related books on the assassination including David Lifton’s bestselling volume on the medical evidence Best Evidence, Anthony Summers’ Conspiracy and Jim Marrs’ Crossfire continued to fuel speculation that a conspiracy was involved in the assassination. In 1988 Nigel Turner’s documentary The Men Who Killed Kennedy brought many of the theories espoused by these and other authors to a more mainstream television audience. Kennedy assassination conspiracy theories gained an even more prominent mainstream voice with the release of Oliver Stone’s JFK in 1991. The film uses the story of the Garrison investigation to showcase almost all of the major conspiracy theories that had been developed over the years. JFK also reignited the controversy over the Garrison case and many news outlets attempted to discredit Oliver Stone’s “countermyth” of the assassination. The film indoctrinated a new generation of Americans born after the assassination into conspiracy lore, and dominated the public’s perceptions of the case for years to come. Public outrage over the film’s revelation that many government files related to the assassination would remain locked for decades to come prompted Congress to pass the President John F. Kennedy Assassination Records Collection Act of 1992. The Assassination Records Review Board (ARRB) was formed to facilitate the release of all government files with information on the assassination. Although the Board had no investigative mandate or authority and no “smoking guns” were revealed during its existence, many conspiracy theorists contend that the documents support their conclusions. Most notably, ARRB Senior Analyst Douglas Horne claims that during his work on the Board he found evidence that there was a cover-up related to the President’s autopsy and authored a multi-volume tome challenging the official story. The popularity of shows such as the X-Files and a preponderance of conspiracy-related cable programs fueled distrust of the American government and proved a fertile ground for continuing the spread of JFK conspiracy theories throughout the rest of the 1990s. By the end of the decade, the percentage of Americans who believed that there was a conspiracy behind the President’s murder once again reached a high of 81%. Most significantly, video streaming, podcasts, blogs and social media have provided the modern JFK research community an open platform to promote or disprove theories regarding the assassination. A number of sites have emerged promising definitive information that “solves” the case. Youtube has made the photographic record of the assassination available to anyone and hundreds of videos have been uploaded espousing or debunking a wide range of theories. 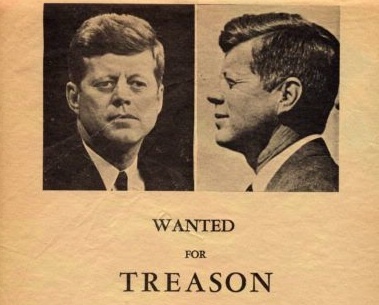 And while the debate over the assassination often devolves into petty rivalries and ad hominen attacks in the comment sections and forums of these various websites and videos on the subject, a vibrant JFK research community has emerged on Facebook which has connected those interested in the Kennedy assassination to various authors, experts and even eye-witnesses around the world. In 2013, the nation commemorated the 50th anniversary of the assassination of President John Fitzgerald Kennedy with a media frenzy of documentaries, films, books, magazines and news reports on the event. Although public opinion has shifted (only 61% of Americans now believe there was a conspiracy to kill the President), it is evident that this tragic event will continue to dominate the public imagination for another 50 years. Meanwhile, the American people are still waiting for that “smoking gun” that will reveal once and for all who really killed our President. Until then, the mystery endures. Nice comprehension of the whole thing! As you know, everybody who has the time and the political consciousness to do decent research on the JFK-murder and it’s cover-up and who has got some brains will find out that the official version is wrong. Lee Harvey Oswald was set up as patsy and JFK was murdered by several hit-teams in corssfire instead, the whole thing and Dealey Plaza was prepared for the assassination by a mud-pool of corrupt CIA-assets, police-men, “secret-service-men”, Cuban exile fighters and a lot of extra, for example TSBD employee Jack Dougherty, who was on the 6th und 5th floor, when the shots rang out. You can see one of the real assassinators in the Bothun photo walk away. Learn more about him on http://www.jfkmurdersolved.com. CIA-mastermind David Atlee Phillips was the main orchestrator, CIA-general Ed Lansdale supervised the scene, he is on photo on Dealey Plaza even, together with the “3 tramps”, as well as “radio man” Orland Bosch, “firestairs man”, “apron man”, “umbrella man”, Lucien Conein, Milteer, Hemmings. There were far more bullet imprints on ground/limo/flesh than 3 bullets can produce. LBJ washed the limo clean at Parland Hospital already. It’s all on photo, you can see the bucket and the ss-man clean the limo! It was not possible for Oswald to do these shots with this rifle and run across the 6th floor afterwards, hide the rifle close to the stairs, run down without meeting anybody and then meet Marrion Baker and Roy Truly in the 2nd floor some 70 seconds after the shots without being out of breath as he was. Look how police captain Will Fritz “ignored” the shot sound of mafia-guy Ruby silencing Oswald INSIDE his police building! Watch it! It’s on film on youtube for everybody! Watch all the videos Gil Jesus aka GJJdude has collected regarding the JFK-case on youtube, if you want to know more! But do something about the present corruptcy in the government and above in the plutocratic money system as well! Now weather the ‘Badge Man’ picture is not all it seems to be or not, there was someone on that knoll or behind the picket fence, a disguise of a police officer makes perfect sense, i mean there were enough ‘fake’ secret service men around. Haha, pretty funny. So this is the original backyard photo huh? Haha. I like how even though they photoshopped the rifle into a banjo, they left the revolver on his side. They should changed it to a harmonica or something. Thanks for the link. They didn’t remove the stock of the rifle, you can see it sticking out, just below the revolver. Hit me with your best shot – – – come on and hit me with your best shot – – – fire away. ok..just a few more things to ponder..the CIA and FBI who were inept sorry pathetic and would later wash the real evidence to hide their shame..Would always prosper when included in the Conspiracy..If the are thought to be smarter than they appear..they win..if the are guessed to be the boogie-man..they win by fear and intimidation..my guess is the Conspiracy was hatched by the Rothschild Clan..when John began printing Silver certificates..Which would have put the screws to the entire mess we live in today..The exact same kills were done to Abe Lincoln and Mckinneley when they decided to put the illegal and Unconstitutional Bavarian tweeks first named Bauer ..later a name upgrade to become Jewish and oh so Davidian..It really matters less to me who squeezed the head shot off..than who could have put this plan together..made it so basic and pedestrian..that it would eventually be picked up by a stupid bunch of white trash and than be carried out by some who actually thought that bullets ..ballots..who gives a rip..?..also .Please once again review the remarkably cool demeanor of a lone nut simple and slow nut job..who in my opine did not fire anything that day..was working for both the dicks at CIA..and FBI..and didn’t seem to be very upset about all this babble..He did bear a remarkable likeness to a “Patsy” that should have gotten us all to pay attention.. Go check out a 5 part tape series called “Two Men In Dallas” that will make you sick with rage and shame as a good and decent Police Detective named Roger Craig tells you the truth about that day..my old worn out phrase has always been ..:”All roads Lead Out of Dallas”..which means you are not gonna get these turds who I know are still directing the sad ship USS America to a destiny not unlike the Titanic’s end..without first putting this National scandal to rest.You keep doing the be-bop o Obama is at fault melody..and what good is that?..he is the spokesman for the Corp.that owns us..WAKE UP..and get educated..to bad stupid and brain dead are not painful huh? Oh..just a couple other questions for those of you who still believe that giving up on finding those who are responsible for our world falling from grace with blood on our hands..to where we are today is the inevitable suicide of to much guilt and to many questions about why we are the way we have become..ok..Who was the expert who put together…the “magic bullet” theory that was accepted as the Gospel by the Warren Misfits..?…Jack Rubenstein was a busy man in the late 50’s..Who did Jack Ruby work for in the late 50’s..and what was his job..no ..it was no Mafia Godfather..?.. What was the original report regarding the “found rifle” in the Oswald snipers nest?..was it the Italian Carcano Rifle..or did Walter Cronkite tell us ….that a far different rifle had been found?..OK..and finally..What charges were filed regarding Lee Oswald by the Dallas police Dept? A conspiracy is: An outcome controlled by ‘more than one’ person, and ‘vision’ is not a gift. . . it’s a curse. Oliver Stone’s commentary (“The Untold History of the United States”) mentioned, for the first time ever in American history, ‘Prescott Bush’ and ‘Joseph Kennedy’ in the same sentence. Start there, as the internet can now, as never before, provide very clear answers. It will NOT be nice when you can see how deep the rabbit hole really goes. It will be hurtful and depressing, but it will answer a lot of other questions. “Telling children about Santa Claus, particularly coming from a loved one, develops a skewed rationale that alters ALL subsequent perception of reality throughout life”. A 3 or 4 yr old has a concept of time and motion, and should therefore reject the notion that their is or even could be a Santa Claus, but because of where the notion comes from, most children will accept the notion. This could be why, as time marches on, children subconsciously ‘reject’ their parents – even if the child doesn’t really know why (they’ve been lied to – now their rationale is maturing, and it’s no fun because nothing really makes sense – and it never really did). A rather interesting read. Thanks for sharing…two thumbs up! It’s way past time to put the fairytale about a lone gunman to bed.